A question I’ve been asked several times is what exactly a person thinks about for 26.2 miles. Music is great and all, but it cannot possibly be enough to occupy your mind for that long. For my first marathon, I was actually advised by Monica to refrain from listening to music. She recommended that I just take in the environment and really soak up my first marathon. I am so grateful to her for that advice. I was able to talk to people, truly appreciate the volunteers and spectators (and hear their encouragement), and focus on the feat I was accomplishing. I have passed that precious piece of advice on to friends since then, and I will continue to do so. Thank you, Monica!! So what about my second marathon? What did I think about during that race? Well, this race was very special to me. 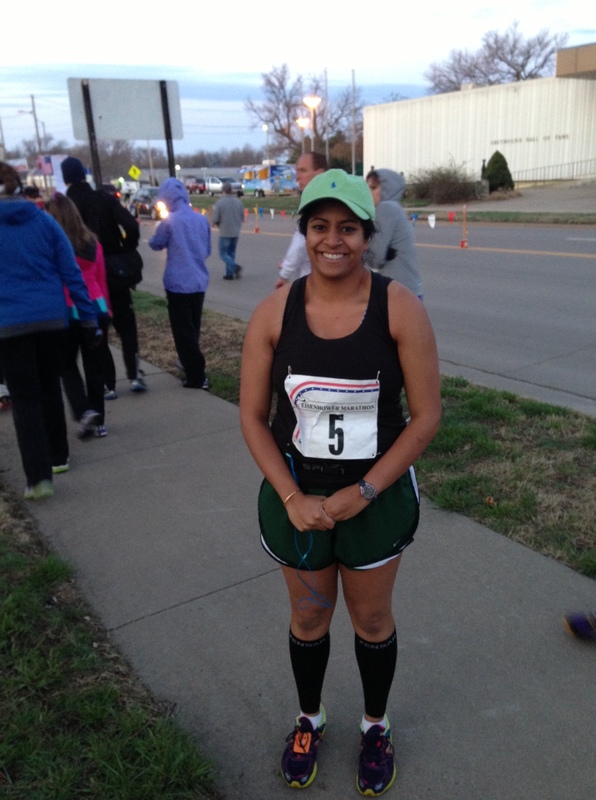 I had to overcome so many obstacles to run that 26.2 miles, and I wanted to reflect on it during the race. But something that was very important to me was that I didn’t lose sight of the true reason my healing process, though extremely painful, had been so remarkable: the incredible people in my life. Before the race–ready to run and focus on the people who provide me with strength. I was going to make a list. A list of 25 people/groups of people who had carried me through the past year with their constant love, support, and prayers. People without whom I would not have been able to heal as miraculously well as I had, and not nearly as quickly. People who filled me with hope and the courage to fight. For each mile of the race, I was going to focus on one of the people (or groups). I was going to reflect on the memories with them from the past year, how they expressed their love to me, and what they had done to lift me up. I was going to open myself up to the dark memories as well, the various things they had to witness or how they must have felt to see me suffer–as we suffered together. I was going to “borrow” their legs for that mile, relying on their support yet again, because without it I would forever be at the starting line. A marathon is 26.2 miles, so why 25 people? Mile 26 was the mile during which I focused on myself. I thought about how I had grown and how far I had come in a year. Just one year, yes, but the longest year of my life. So although I crossed the finish line on my own two feet, I ran the race on the feet of the people who loved me enough to lend me theirs. This entry was posted in Anecdotes, Fitness, Healthy, Marathon Mondays, Running and tagged advice, doctors, emotional, family, fitness, friends, healing, health, healthy, love, marathon, monday, mondays, motivation, music, nurses, people, perseverance, race, run, running, strength, support, thanks, thinking. Bookmark the permalink.